After considering for over two years of buying an Irish Wolfhound, little Valley of Tylwyth Teg (X-Files Fionnmae x Tylwyth of Beltine) joined our family in December 1997. She rapidly grew to size XL (ca. 84 cm on shoulder). Thanks to her breeder I started to present her on dog shows and she turned out to be successful. Valley had a wonderful character: she was very joyful and kind to our four children and all the animals living in our house. My husband being a vet, plenty of animals share our home. We wanted at least another of these wonderful dogs and Zizanie of our Valley was born on 3rd of January 2000, but once you are fond of these gentle giants you will see you cannot get enough of them. 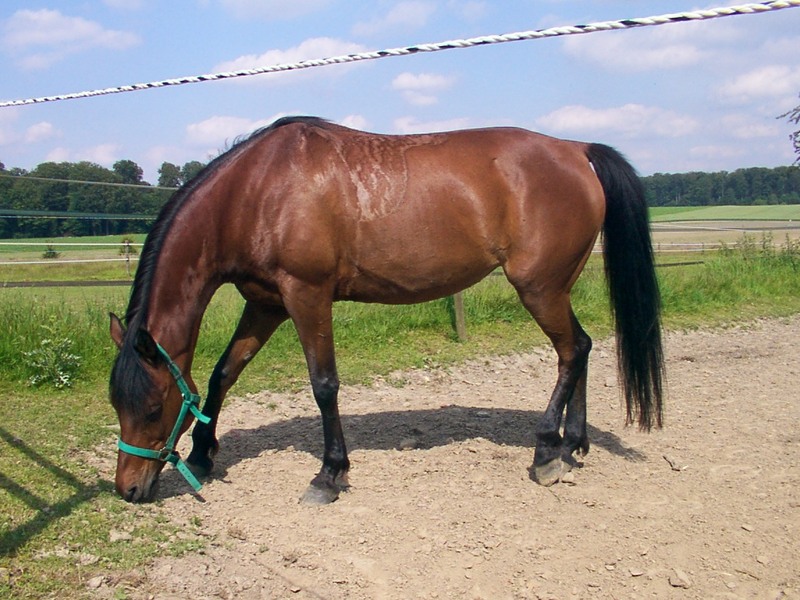 In March 2000, Maol-Cu You (Curoi Armani x Maol-Cu Jessred) joined our family at 13 month of age. 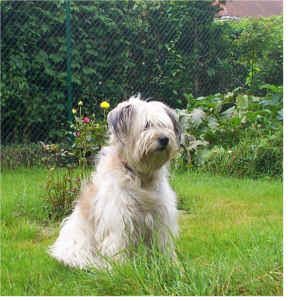 She adapted wonderfully and was Valley's favorite playcompanion. She was very gentle with Zizanie from the beginning and proved to be a wonderful mummy too. 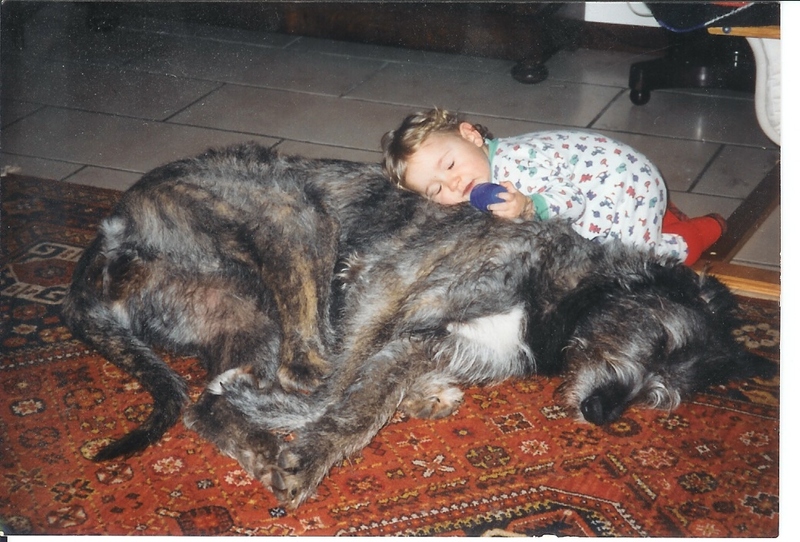 In November 2001, Chipie, a rescue Pyrenean shepard did join our family, completely different in character from the Irish Wolfhounds, but a true play companion for our kids... and also for the Irish Wolfhound pups. In 2002, I lost my 19-year-old Chowchow mix Manou and Nannou aka Chinouk, a pure-bred Arabian horse did join in the same month. I discovered the pleasures of taking my Irish Wolfhounds for rides in the forest or should I say, they discovered the pleasure to take me and my horse on their walks ? In 2003, Cohiba (Brokenwheel Uracil x Maol-Cu Only You) was born and became part of the family. She is one of the most open Wolfhound I ever met. No problems whatever, no fear, running to greet everybody, people and dogs. 2004 has been a bad year, in 5 weeks time we did loose Only You and Valley. They always say that one wolfhound rarely comes alone, well unfortunately they rarely leave alone too. 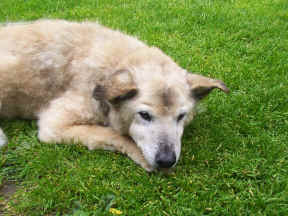 I think the months from April to September have been the worse I ever had with any of my animals knowing Only was ill,saying bye-bye every day, looking for the first sign of pain knowing that it would mean the last day. Valley left on just one day, I do not know what was worse, knowing or not getting the chance to hug her a last time. Everything seemed so empty. Two pups will come to fill the empty space, but no dog can ever replace those that left in our hearts, but there is plenty of room left. Luckily a part of them will live in their puppies. We have produced 7 litters so far and all the pups are followed up thouroughly. 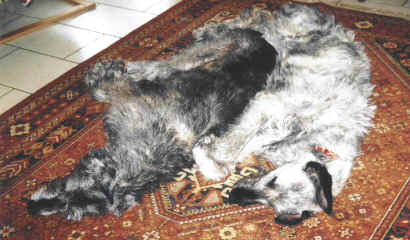 Irish Wolfhounds have become part of our lives, we could not think being one day without them. 2005 has brought us Culann back, Cohiba's brother. I had said I never wanted a male, but how can you say no. 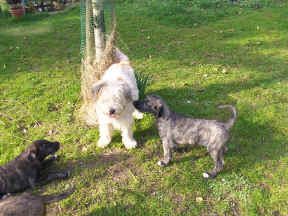 Culann had problems with the pack at home, the other males did give him a hard time. He now is happy with us and especially with Zizanie and his sister who is his best playmate. In September we were blessed with two litters, but since Zizanie only had 3 males, I only kept little Eireann out of Cohiba. So in 2006 I will either have a daughter out of Zizanie or a granddaughter. (Ch. El Brillo x LM Alisha by CWP Chances Are). We wish to thank Mr and Ms. Huemer from La Movida in Austria for letting us have this gorgeous horse. In 2007, another horse, LM Porleen, a broodmare came all the way from La Movida, a really unexpected addition. Porleen is a sweet and gentle mare. 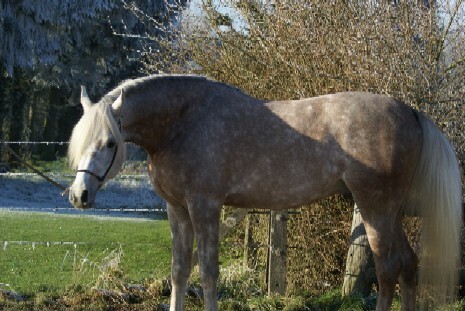 She will give birth to our first foal in May 2008. In June, Valley's great grand daughter Gipsy of Our Valley (Darshan of Our Valley x Cohiba of Our Valley) was born. This was the occasion to finally take something back since Zizanie is in my eyes is too old to reproduce again even if still in amazing condition for her age. She turned 8 on 3 January 2008. 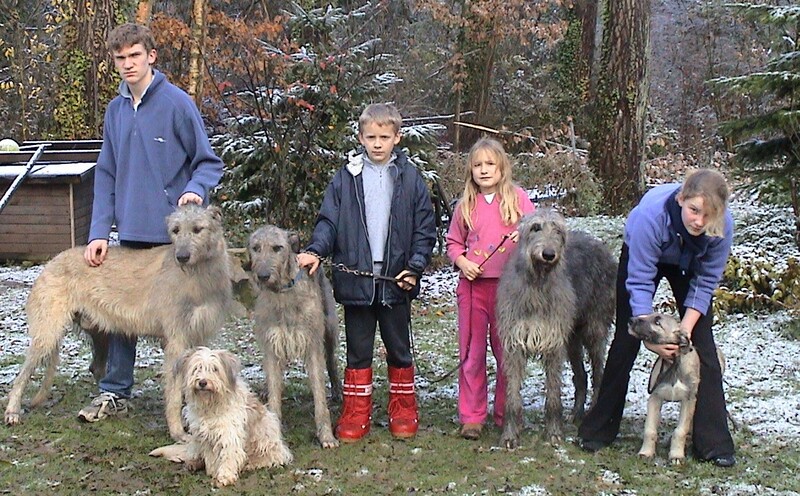 How do you know you have to many Irish Wolfhounds, if this is possible, or animals in general ?